The speaker, cooler hybrid provides a good upgrade over the stock laptop audio by offering great sound quality. Although the cooling part leaves a lot to be desired, it still works with its intended purpose. When I first unboxed the N700 and held it in my hands, I was immediately surprised with how solid the entire structure felt. There were no squeaks or cracks as I thoroughly inspected it all around. A great impressions to start out the review with, and a big plus to Logitech since this device is constructed completely out of plastic. In terms of design, the N700 Lapdesk is a handsome device that would not look out of place in any home environment. The top is composed of several sections of tough matte plastic panels that house the fan and both speakers, as well as a handy volume/fan control on the right edge. The bottom is lined with a layer of extremely comfortable air-mesh polyester padded with polyurethane. The shape of the bottom is actually concave to the resting surface to facilitate better airflow, and to isolate your body from the heat when resting the N700 on your legs. Logitech states that the N700 can support notebooks up to 16 inches in screen size, and indeed the 15.4″ Lenovo T61 is about half an inch away from obscuring the speakers entirely. However, the Lapdesk N700 definitely does not dwarf the notebook or appear out of place due to its increased size, and definitely complements the overall look very well. 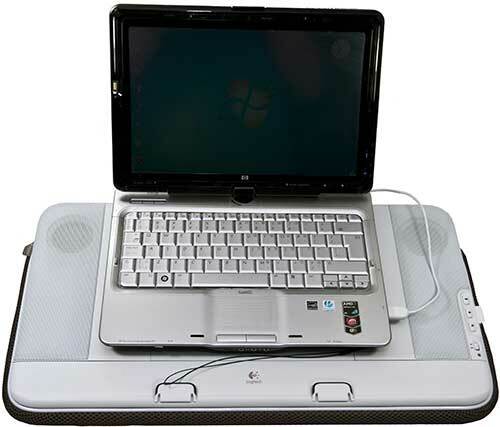 HP tx2000 12.1″ convertible notebook sitting on top of the Logitech N700. Lenovo Thinkpad T61p 15.4″ sitting on top of the Logitech N700. The cooling is supplied by a single variable speed 80mm fan placed in the middle, with large vented grilles on both sides to allow great air flow. Do not let the size fool you, this fan actually pushes a very respectable amount of air while remaining extremely quiet. Unlike the previous Logitech N100, the N700’s front sits flush with the bottom of the notebook. The 80mm fan creates a negative pressure zone below the notebook and draws in the warm air to exhaust it in the spacious area below the cooler. Along with the good airflow, the fan is also extremely quiet. It is virtually inaudible over the operational noise from the laptop. Great job Logitech. In order to secure the notebook to the front face, the Speaker Lapdesk N700 provides two foldaway “legs” that stop the notebook from sliding down. Two additional grips are provided in 4 mounting locations depending on the notebook size to further secure the device. Rest assured, that I had a very difficult time trying to make my notebook slide off short of tilting it close to 90 degrees from horizontal. Even the petite 10.1″ HP Mini 1000 had no problem sitting tight on the N700, although in this case the cooler does appear to be a bit overwhelming. Now the last thing I want from sitting down to enjoy a movie is having to drag a knot of cables with me and having them tangle everywhere. However that is the typical case when a notebook cooler is used in conjunction with portable speakers. Not only do users usually lose 2 USB ports, they also have to deal with the resulting cable mess. Fortunately, Logitech has incorporated everything into one convenient USB cable, and it alone powers the fan and both speakers. Even better, this cable can be neatly tucked away in the provided slots no matter where the USB port is located. Another kudos to Logitech for beautifully integrating the cooler with the notebook. Now comes to the key feature that sets the N700 apart from the rest of the herd. The two neodymium speakers featured on the unit appear to be 50mm in diameter. Logitech states that these are rated to 2W of peak power each, which is quite standard in terms of portable standards. Let’s see how good these speakers actually perform. This song is a great test for soundstage and treble. The N700 definitely performed well here for its purpose. The soundstage separation was good, and the treble definitely was not lacking the sparkle I was looking for. The Lapdesk again shines here with some good reproduction of the vocals by VanVelzen. However the vocals were slightly overshadowed by the background music, which indicates that the N700 suffers from a slight case of recessed vocal range. The purpose of this song is to test the quantity, quality, and extension of the bass. The speakers showed a good amount of impact for the bass, and for the frequency that it could reproduce, the quality was good, and not muddy like many other small speakers out there. However, they did not demonstrate good bass extension as the bass clearly rolls off after the 100Hz range. To put it simply, you will hear explosions and impacts in movies, but it will be very difficult to “feel” it. The movie was thoroughly enjoyable through the speakers with the added fidelity and a more full sounding experience. Overall, the N700’s pair of USB speakers performed well for its purpose, and is definitely a great improvement over the standard laptop speakers by offering a richer sound, as well as a better sense of fidelity and effects. Compared desktop solutions, it is superior than most OEM speakers. However there is a distinct veil over the sound, which makes the sound feel somewhat artificial and distant, as well as causing the bass to be somewhat anaemic after 100hz. Upon further inspection, the culprit was found to be the steel mesh protecting the speakers. A prime example of this effect is the Sennheiser PC350 headset, which had a solid cover over the drivers with minimal opening, which limited the driver movement and produced very shallow bass as a result. Lastly, I did notice some crackling sound during high bass intensity at a high volume. I’m not sure if it’s a problem with the review sample, but it will not occur as long as the volume is set to reasonable levels. 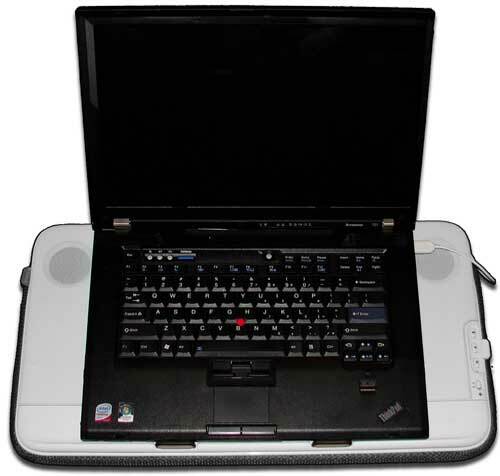 The thermal cooling performance of the N700’s USB cooler was tested on a Lenovo 15.6″ T61 notebook with Intel T7300 2.0Ghz dual core processor on the Intel PM965 chipset. Temperature readings were taken with CPUid Hwmonitor. Initially I had some doubts about the cooling effects of the N700 on the T61 since it is a side-exhaust model with no bottom intake. However, I was proven wrong when I observed the difference in temperatures from the additional cooling offered by the N700. My protocol for testing is always idle first for 10 minutes with no background applications running. The idle temperatures without the Speaker Lapdesk N700 was on average 50.5ºC for CPU and 51.5ºC for chipset. The potential for the N700 immediately showed as temperatures dropped to 47ºC, and 50ºC respectively. Computer enthusiasts always use load temperature to test the cooling efficiency of their computers, and the test conducted here is no different. I used Prime95 to stress both cores with one thread each. The temperatures again revealed the benefits that the N700 offers with temperature dropping for the CPU from 74ºC to 72.5ºC, and 75.5ºC to 74.5ºC for the chipset. The differences may seem minor, but the significance of the USB cooler is that it draws the hot exhaust away immediately instead of having it circulate, which leaves a distinctly cooler feeling notebook, as well as prolonging the lifespan of other components by redistributing the heat quickly. The Logitech Speaker Lapdesk N700 has done an admirable job replacing the stock laptop speakers with something that’s magnitudes better, as well as offering a quiet and comfortable cooling solution both in one convenient package. It is the perfect product for someone who wants a convenient upgrade for better sound without the cluttering cables found on portable speakers, with the benefit of having a comfortable platform to rest the notebook on so they can focus on the entertainment without fearing for the safety of the notebook. The sound quality may not be the best out there, but it is exceptional for the entire package and value. And it can do it all with just 1 USB jack.